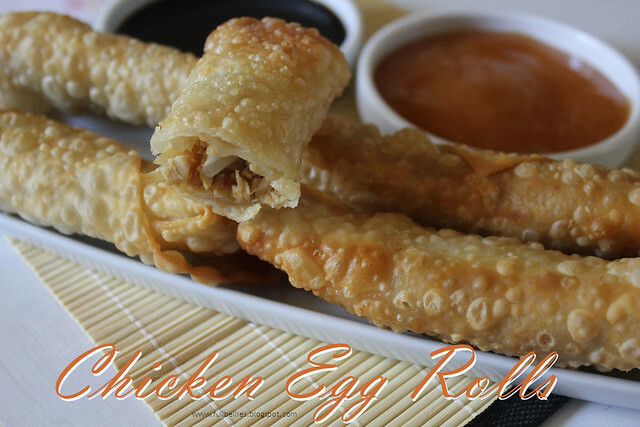 For as long as I can remember, I've loved Egg Rolls. I know they're also one of my dad's favorite things, and my hubby's too. 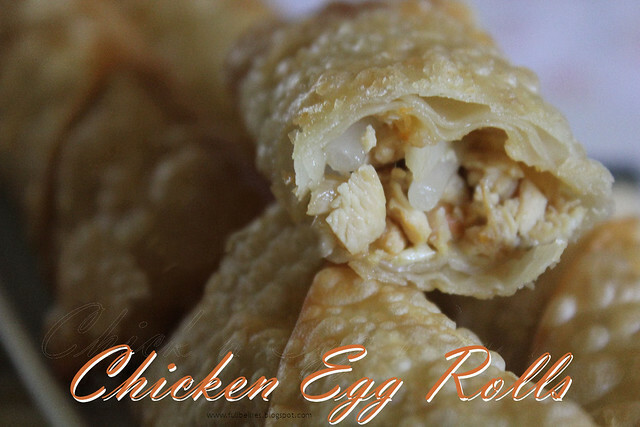 So tonight I was trying to figure out what to make for dinner, and I got a craving for some egg rolls. I've NEVER made them before, I had no idea what the ingredients were etc. BUT I had some Lumpia Wrappers that I usually make Crab Ragoon with, and I decided to give it a shot. Let me tell you, YUMMY. I'm so proud of myself and really excited because now I'm going to buy some shrimp and make some Shrimp Egg Rolls, plus I have some crab meat that I might make some out of too. Mix the chicken, onions, mushrooms, bean sprouts and soy sauce. 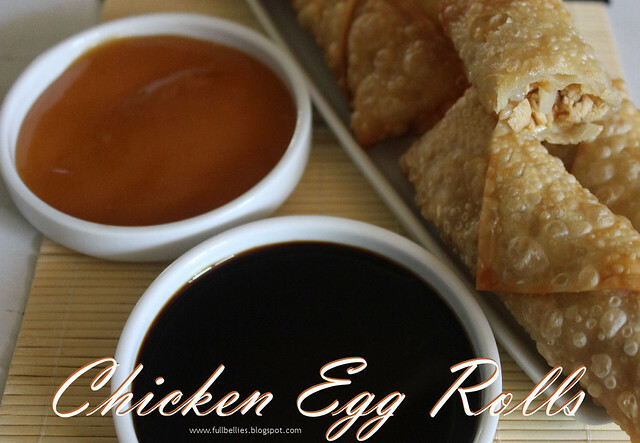 Start making the egg rolls, now for those that have never made them, the back of the Lumpia Wrappers package, usually shows you how to do wrap them. It's actually really easy. If you want to see another way of rolling them up, just go HERE, the lady in the blog actually has pictures posted showing you how she makes hers. Let me know if you like them :) Enjoy!!! 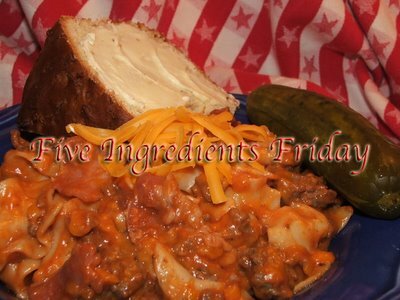 I'm once again participanting in Overwhelmed's feature called Five Ingredients Friday. 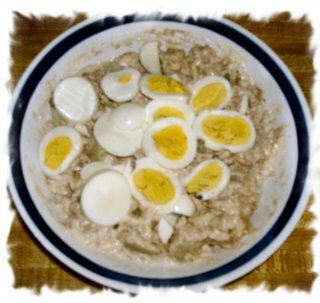 Check out my last week's contribution for an easy summer lunch "Tuna Salad". 1. Preheat oven to high. 2. Cut potatoes and spread out on a cookie sheet. 3. Coat potatoes with extra-virgin olive oil, dried herbs and steak seasoning or, salt and pepper. 4. Spread potatoes to the corners of the cookie sheet. 5. Cook potatoes in very hot oven 25 minutes. 6. Turn potatoes once, half way in the cooking process. 7. Serve fries hot from the oven. 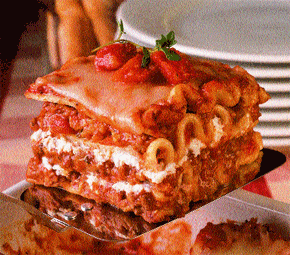 For dinner I'm making this Lasagna recipe that I saw on Sandra Lee's show. It is REALLY good and so easy to make, just what I like. Bring a large pot of water to a boil and add salt. Boil noodles according to package directions. Drain and arrange in casserole (see below). While noodles are boiling, brown beef in a large frying pan over medium-high heat, adding chopped onion, garlic and oregano to meat as it cooks. When meat has browned, drain off fat and then add tomato soup and apple cider vinegar. Simmer for 20 minutes. Spray a medium casserole dish with a nonstick cooking spray. Lay noodles lengthwise across bottom of casserole dish. Spread a layer of cottage cheese over top of noodles. Add a layer of meat mixture, then cover with mozzarella cheese and repeat for a total of 3 layers. Finish with a layer of cheese and bake for 30 minutes or until bubbling. Remove from heat and let stand for 5 minutes before cutting and serving. Tonight I'm making Mushroom Bacon Burgers and even though I forgot to buy charcoal for my smoker/grill, I'm happy that I picked up that indoor smokeless grill, cause I can use that one. These are really good and it's a nice change from the usual plain burgers. In a bowl, combine the first six ingredients. Crumble beef over mixture and mix well. Shape into four to five patties. Grill over medium-hot heat or fry in a skillet for 10-12 minutes or until no longer pink, turning once. Serve on buns with tomato if desired. I absolutely LOVE orange chicken, now I know there is no actual orange fruit in this recipe but it's the gravy that gives it that nice deep orange look and it's just wonderful. 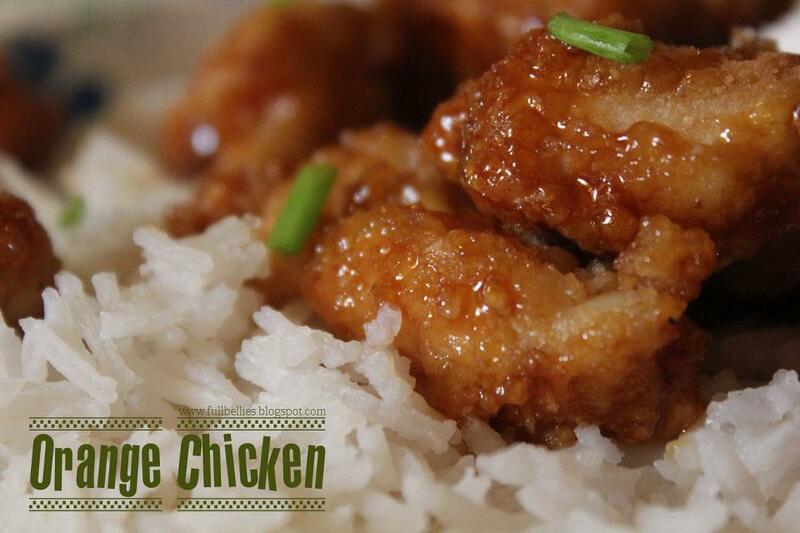 The kids and the hubby LOVE it and so do I, it's my go to when I'm craving chinese food. Beat 4 eggs together and add a little milk. Mix cornstarch, flour and garlic powder together. Dip chicken pieces in the flour then egg. Fry in hot oil until golden brown. Place chicken in casserole dish. Combine all ingredients and bring to a boil over medium-low heat. Stir until sugar is dissolved and ingredients are blended. Bake at 350 F, for 45 minutes or until chicken is cooked thoroughly. Alright I managed to get the menus done and ready to post. I was supposed to do it yesterday but with all the rain and thunderstorms we've been having, our internet got knocked out yesterday and only restored this morning. So here we go, remember though that this is a general idea, if I don't feel like making something one day, I will just switch it over with another day. I'm not including breakfast and lunch this time because usually for breakfast we have the same things and for lunch it just depends on what is going on that day, if we're home or running around. Quick and Easy Tuna Salad!!! EDIT: Overwhelmed has this weekly Five Ingredients Friday theme going on, I had no idea she did, but she mentioned it to me and now I'm eager to play along. She asked if I wanted to share this one and I am doing so now. So I'm editing my original post to make it a Five Ingredients Friday Post. My kids and I love Tuna Salad, but since Curt doesn't care for it, I make it a lot during the summer for our lunches. There is no secret recipe or right/wrong way to make it. I know there's a lot of different recipes for it, but this is how I make mine. I start by cooking my potatoes either in a pan on the stovetop, or for a quicker way, I do it in the microwave. Four potatoes for about 10 minutes or so, just keep an eye on them. Remember to poke some holes in them before. In a serving bowl I put the tuna, then add the onions, potatoes (chopped into bite size pieces), lettuce and mayonnaise, combine everything and then add the hard boiled eggs. Arroz Doce - Portuguese Rice Pudding!!! Last night I had made spaghetti for dinner, and we all know how easy that is right??? Well I was in the mood for some sort of dessert and didn't know what to make at first, and then I remembered my greatgrandma making Arroz Doce (portuguese rice pudding). She would make it for dessert after dinner, or for family get togethers. It's one of the most known portuguese desserts, and if you go to any portuguese restaurant anywhere in the world, you're sure to find it on the menu. It's delicious and easy to make. This makes a great dish for a get together, church potluck etc. and cinnamon stick. If you don't have the cinnamon stick, don't worry, just use ground cinnamon, it works as well. When bubbles form at edges, stir in rice and reduce heat to medium-low. Remove from heat, remove cinnamon stick and vigorously stir in beaten eggs, a little at a time, until well incorporated. Pour into serving dish, sprinkle with ground cinnamon and serve warm. Who doesn't love a yummy dessert??? 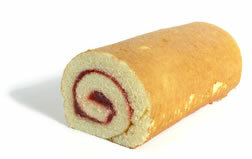 I think they are one of my downfall's, nothing like a gorgeous cake, a pudding, or an old fashioned Jelly Roll. That's the recipe I'm sharing today. Whenever I make these, they disappear that same day. I usually make two and Curt and the kids just devour them. 3 large eggs, 1 cup fine flour, 1/2 teaspoon lemon extract, 1 teaspoon baking powder, 1 cup pastry flour, 1/4 teaspoon salt, 2 tablespoons cold water, favorite preserve for filling, confectioner's sugar for dusting. Separate eggs, beating yolks and sugar together till quite thick; add extract, then add lightly the stiffly beaten egg whites. Sift together 4 times flour, baking powder and salt; fold very lightly into egg mixture alternately with the cold water. Turn batter into a jelly roll pan, which has been lined with well-greased paper. Bake in moderate oven (350°F) for about 10 minutes; turn out on a clean, slightly damp cloth. Remove paper; cut crisp edges from sponge, spread with favorite preserve and roll quickly while the sponge is still warm. Sift fine confectioner's sugar on top. For dinner tonight I made Baked Mexican Chicken. It's a recipe I've had for a long time and we all enjoy it. 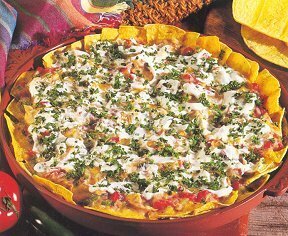 If you are fan of casseroles and mexican dishes, you will definitely enjoy this one. Preheat oven to 325'F. Melt butter in a large skillet; add onion and pepper. Cook until tender, about 5 minutes. Stir in soup, undrained tomatoes and chicken. Tear tortillas into bite-size pieces. Spray a large casserole dish with cooking spray. Layer tortillas, soup mixture and Monterey Jack cheese in prepared casserole. Mix sour cream, milk and jalapeno in a small bowl. Spread over top of casserole. Bake chicken until bubbly, about 40 minutes. Sprinkle with parsley. Serve immediately.